Tenacious D is a band. 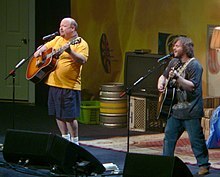 The members of the band are the actor Jack Black and his best friend Kyle Gass. The band started in Los Angeles, California in 1994. Their songs have lots of profanity. Including Tribute, Beezleboss and so on. This page was last changed on 9 March 2015, at 18:11.